The heatwave may be over, but with all of the beautiful produce at the markets right now we are all about salads. And not just your average salad – we’re talking beautifully balanced, nutritious, colourful and filling salads. Our hand-selected vendors have some of the best salads in the game. Use Feedr to browse amazing vendors who offer both sharing platters and individual box options. We ensure ordering is a simple and seamless process. Your colleagues will be happier and more productive after a nourishing and balanced lunch. 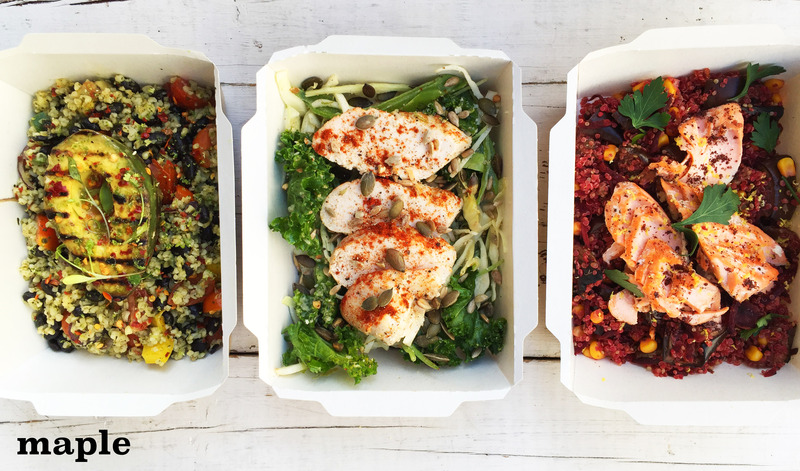 Deliciously Ella’s Delis (formerly the MaE Deli) have just launched a new menu featuring dishes like Tahini cauliflower and spring quinoa salad. Add one of their seasonal falafels for a bit more protein and a complete meal. Karma Cans rotate their dishes on a weekly basis. One of their features this week is a fish taco showcasing raw salmon ceviche, spring onion, chopped avocado salad on tomato rice, green chilli sauce and lime. Visit our website to place an order for your team today and we’ll take care of the rest. If you need help selecting a vendor we can provide some suggestions based on your needs to ensure you get the right food for you and your office.